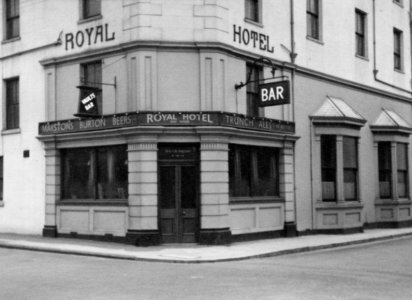 ROYAL HOTEL (Gt. Yarmouth) Ltd. Accused 7th August 1839 of selling wine, spirits and tobacco without a licence - Outcome to be discovered. A Free House selling Marstons Burton Beers, Trunch and Worthington Ales. BIRD'S ROYAL HOTEL & POSTING HOUSE when opened. The Opening Dinner of Mr. & Mrs. Bird was advertised 9th May 1840 to be held on the 20th May 1840. Tickets 12s each. Mr. & Mrs Bird, late of the Star Inn, announced 27th June 1840 that the Delightful Marine Residence had been completed. For he 1841 Season, Mr. & Mrs. Bird provided Hot and Cold Sea Water Baths for the accommodation of visitors, whenever required. The first `Seaside Hotel' to be built at the resort. Visited by Charles Dickens in 1848. Mrs Eliza Sizeland informed her Friends and the Public, 11th November 1854, that she had taken the Hotel and confirmed that Families, or Ladies and Gentlemen could be boarded by the week or month, very reasonably. Partially rebuilt 1877. 100 bedrooms recorded 1934. Closed for the duration of WWII according to a letter dated 26.07.1941.